Chiropractic is a branch of the health sciences which focuses upon the body's neuromusculoskeletal system. A chiropractor is concerned with how your body's skeletal and nervous system is functioning. Since your spine is the key highway for your central nervous system, a chiropractor is trained to use a variety of diagnostic methods to examine and treat your spine and bone structure. Although the major focus of chiropractic is on the spine and central nervous system, your chiropractor is concerned with the wellness of your whole body. Since your nervous system determines how well you feel physically, mentally, and emotionally, many problems you are experiencing may be related to a problem with your spine and nervous system. This is a widely used type of chiropractic manipulation/ adjustment that includes most of the procedures taught at chiropractic schools. This technique is the most commonly used of all chiropractic techniques and is the one probably most familiar to patients. The Diversified manipulation/adjustment entails a high velocity, low-amplitude thrust that usually results in a cavitation of a joint (quick, shallow thrusts that cause the popping noise often associated with a chiropractic manipulation/adjustment). As the name implies, the Diversified Technique can be used to treat many of the joints in the body. Fascia is the soft tissue component of the connective tissue system that permeates the human body. It interpenetrates and surrounds muscles, bones, organs, nerves, blood vessels and other structures. In this case we are specifically referring to the fascia which surrounds muscle. The practitioners use knuckles, elbows, or other tools to slowly sink into the restricted fascia applying a few kilograms of force and then stretch the fascia. This is sometimes referred to as deep tissue work. Direct Myofascial Release seeks for changes in the myofascial structures by stretching, elongation of fascia, or mobilising adhesive tissues. There can be a misconception that the direct method is violent and painful. It is not essentially aggressive and painful, as the practitioner moves slowly through the layers of the fascia until the deep tissues are reached. 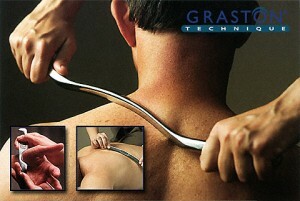 Originally developed by athletes, Graston Technique® is an interdisciplinary treatment used by more than 10,000 clinicians worldwide—including physical and occupational therapists, hand therapists, chiropractors, and athletic trainers. GT is utilized at some 930 outpatient facilities and industrial on-sites and by more than 165 professional and amateur sports organizations. This is a specific chiropractic method and is a variation of the Diversified technique that uses a special table with several segments called drop pieces. These segments can be cocked up a fraction of an inch, so when the thrust is delivered, the table will drop this fraction of an inch. The drop pieces assist the thrust while minimizing the force used for the manipulation/ adjustment. Cavitation (release of gas which makes a “popping” noise) of the joint may or may not occur. Evolved from nearly 40 years of empirical study and 15 years of clinical research, the Activator Methods Chiropractic Technique (AMCT) uses the Activator Adjusting Instrument to give consistent low-force, high-speed chiropractic adjustments. This is a hand-held, spring-loaded instrument-based manipulation/adjustment protocol. Instead of the manipulating/adjusting forces being delivered by hand, force is generated with the small appliance that delivers a lighter, but quicker, thrust than can be delivered by hand. Activator can be used as a primary treatment protocol for all patients or a selective method for patients who may not desire manual manipulation/adjustment or where manual manipulation/adjustment may be contraindicated.